The Aero Club of Vermont was formally established in Burlington, Vt., on July, 6, 1916. It should be noted that there was another club with a similar name known as the “Vermont Aero Club”, which had been established in Rutland, Vt., in either 1908 or 1909. Neither club is still active today, and it’s unclear if there was any link between the two, or if the former club merged with the latter. While both clubs were open to those with an interest in aviation, it appears that the Rutland club (Vermont Aero Club) was established primarily for balloon ascensions, and the Burlington organization (Aero Club of Vermont) focused more on airplanes and state defense, and later on the establishment of airports. The following Vermont newspaper articles relate to both organizations. It has been noted that after July of 1916, the newspapers sometimes referred to the Aero Club of Vermont as the Vermont Aero Club. The following article appeared in The Bennington Evening Banner, April 14, 1908. Rutland, April 12, – There is an indication that ballooning may supplant league base ball in Rutland this summer. A meeting will be held tomorrow evening to discuss a movement to form an aero club, the idea of the business men who are at the bottom of the project being that the novelty of balloon ascensions would do more to advertise the city than base ball. Rutland is the first Vermont town to spring an aero club, the incentive having been by the success of the North Adams and Pittsfield clubs. Notice Received That Aero Club Has Added Vermont City To Its List. 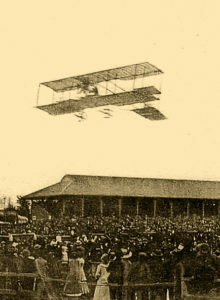 Rutland, June 23, – That Rutland is to be added to the list of Aero club stations in New England, is announced in a letter just received by sec. H. W. Allen of the Rutland Improvement League from Charles J. Glidden, whose balloon, the Massachusetts, made a trip from this city to Gilmanton, N. H., last Friday. The letter states that the committee on balloons and ascensions has recommended this station to the Aero Club, and that official notice of the fact will be sent to all the clubs of the United States. The following article appeared in the New York Tribune, July 21, 1909, page 7. Winsted, Conn., July 20, – Winsted today witnessed a thrilling descent by three aeronauts. William Van Sleet, pilot; C. T. Fairfield, of Rutland, Vt., publisher and editor of “The Rutland Evening News” and president of the Vermont Aero Club, and Professor Oswald Tower, of North Adams, teacher of science in Wesleyan Academy, Wilbraham, Mass. The men ascended from Pittsfield, Mass., at 8:40 a.m. When at an altitude of 8,900 feet the balloon started across the town and then suddenly began to drop. So rapid was its descent that all three men were rendered deaf for half an hour. The party finally landed without accident on the farm of Daniel O’Neil, in Mooreville. All ballast in the car had been dumped to avert a landing in the heart of Winsted’s business district. It was van Sleet’s thirty-sixth flight, and he said he never experienced a quicker ride to earth. The following article appeared in the Burlington Weekly Press, July 29, 1909. Rutland, July 27, – Pilot William Van Sleet of the Pittsfield Aero Club made an ascension here at four o’clock this afternoon in the balloon Massachusetts with four Rutland people, H. Clayton Carpenter, Frank M. Wilson, Charles H. West, and Harry A. Mattison. The start was made in the presence of 1,000 people with the most favorable weather conditions, a light breeze driving the big bag slowly out of sight over the mountains east of the city. Pilot Van Sleet will make another ascension here next Thursday, the first under the direction of the new Vermont Aero Club. By 1916 the airplane had progressed to the point where it was being used as a weapon of war in Europe. At the same time the United States was facing the possibility of becoming involved in World War I, and there were those here in America taking proactive action. Some military leaders began looking to the nations aero clubs for possible recruits. The following article appeared in The Barre Daily Times, May 31, 1916. Admiral Robert E. Peary, the discoverer of the North Pole, who is now devoting his entire time to aeronautics and aviation, is to be the guest of major Wallace Batchelder, of the Aero Club of America, at Norwich University, Northfield, July 6, and will help perfect the organization of the Aero Club of Vermont, at that time and place. Other distinguished officers and civilians will be present to help launch what promises to be one of the largest aero clubs in America. All persons who desire to become charter members of the Aero Club of Vermont should make application before July 6 by letter addressed to Major Batchelder, Aero Club of America, 297 Madison Avenue, New York. The following article appeared in The Bennington Evening Banner on July 8, 1916. Burlington, July 6. – The exercises attending the formation of the Aero Club of Vermont and the prominence of the speakers attracted a large crowd to Camp Governor Gates today. The event presided over by James Hartness of Springfield. Gov. Charles W. Gates welcomed the distinguished visitors and commended the excellent showing made by the 1st Vermont regiment now on the Texas border. The principal speaker of the day was Rear Admiral Robert E. Peary, who discussed the advisability of every state preparing an adequate aero service in connection with its national guard. Augustus C. Post, manager of the approaching military transcontinental aeroplane flight gave an interesting history of aviation in America. Those present had the opportunity to inspect the 1st Vermont Cavalry now being recruited at the state camp to war strength. President, James Hartness of Springfield; vice president, Adjt. Gen. Lee S. Tillotson; secretary, James P. Taylor of Burlington; treasurer H. R. Roberts, dean of Norwich University; governing board, Gov. Charles W. Gates of franklin, Col. Ira L. Reeves, commander of 1st Vermont Infantry, Maj. Wallace Batchelder, commanding 1st Vermont Cavalry, Clark C. Fitts of Brattleboro, Horace F. Graham of Craftsbury, Redfield Proctor of Proctor, W. A. Scofield and James P. Taylor of Burlington and James Hartness. The crowd was somewhat disappointed that no aeroplanes or demonstrations were present. The following excerpt is from The Barre Daily Times, July 6, 1916. The following article appeared in the Essex County Herald, November 17, 1916. The first annual meeting of the Aero Club of Vermont will be held on the 27th at the Hotel Vermont. The annual dinner of the Club will be at seven o’clock to be followed by addresses and the annual business meeting. All citizens of Vermont interested in aeronautics are urged to be present. Tickets for the dinner may be secured by application to James P. Taylor, Secretary, Stannard Memorial building, Burlington, Vermont. The Aero Club of Vermont came into existence to meet the peculiar needs of Vermont, both in respect to its economic development in times of peace and its complete military preparedness to meet any conditions arising out of disturbance of our peace. The membership of the Club is made up of those who are interested in promoting Vermont’s aeronautical interests, and is not restricted to air pilots or those who, as passengers, make occasional trips in air craft. There is a distinctive service which everyone can render to Vermont, either by becoming a member of the Club or by co-operating with Club members. Vermont now needs landing places for the air craft. In the present state of the art, flying in Vermont is unsafe unless one keeps within a short distance of a landing place. The aeroplane must descend as soon as the engine fails, and although some engines can make a continuous run of several hours, it is still a matter of common experience to have the engine stop unexpectedly. The descent under favorable conditions may be made at a downward pitch of one in eight. hence if one is flying a mile high he can volplane a distance of eight miles. But he never should be farther from a landing place than eight times his altitude. This means that in order to make it possible to fly in safety through Vermont there should be a chain of landing places separated by a distance of not more than sixteen miles. Of course, a wind blowing in any direction would change the matter favorably or otherwise. It is highly desirable to get routes through Vermont in all directions, and the landing places should be even closer together than the sixteen miles. It is a very fascinating subject to follow. The aero papers, such as the monthly publication “Flying” and the weekly “Aerial Age”, contain the latest information. Both of these papers are published in New York City. Membership in the Vermont Aero Club gives each one an opportunity to attend the meetings and other functions of the Club and get the pleasure that comes in cooperating in an effective way for the betterment of our state, town, and lives. There is no more inspiriting subject and surely very few can compare with it for great potency for future development. Joining the club gives us a practical opportunity to express our patriotism. It may be infinitely small compared with the service rendered by those who enlisted in the National Guard, but nevertheless it is of great value. If you wish to become a member send a letter to Mr. James P. Taylor, Secretary, Aero Club of Vermont, Burlington, Vt. The following article appeared in The Brattleboro Daily Reformer on July 26, 1919. Rutland, July 26, – There were two meetings of the Rutland Business Men’s Association in their rooms yesterday, a special meeting being called for yesterday afternoon at 3 o’clock to hear a talk by James Hartness, the Springfield manufacturer and inventor, president of the Vermont Aero Club and a licensed aviator, on the importance of towns establishing airports or landing places for aircraft. Mr. Hartness is the recognized head of air interests in Vermont and has advocated the necessity of all towns having such landing places in consequence of the early establishment of regular air routes for the delivery of mail, small express and passengers. The resolution was offered by Dr. J. M. Hamilton placing the association on record in favor of procuring an airport here. The following article appeared in The Barre Daily Times on September 15, 1919, page 8. Governor P. W. Clement sent the following letter to James Hartness in appreciation to his gift of an aviation field to the village of Springfield. “Please accept my heartiest greetings on the occasion of the first commercial flight from one Vermont landing field to Vermont’s first municipal landing field, at Springfield. James Hartness was elected Governor of Vermont in 1920, and served until 1923. As Governor, he resigned his position as President of the Aero Club of Vermont. It is unknown when the Aero Club of Vermont disbanded, but it is known to have been operating in the early 1920s.